Aug. 6, 2014. I took summit photos in two different shirts. Home Sweet Home, August 6, 2015 — I wasn’t going to write a one-year-retrospective. Most of them are boring and trite. 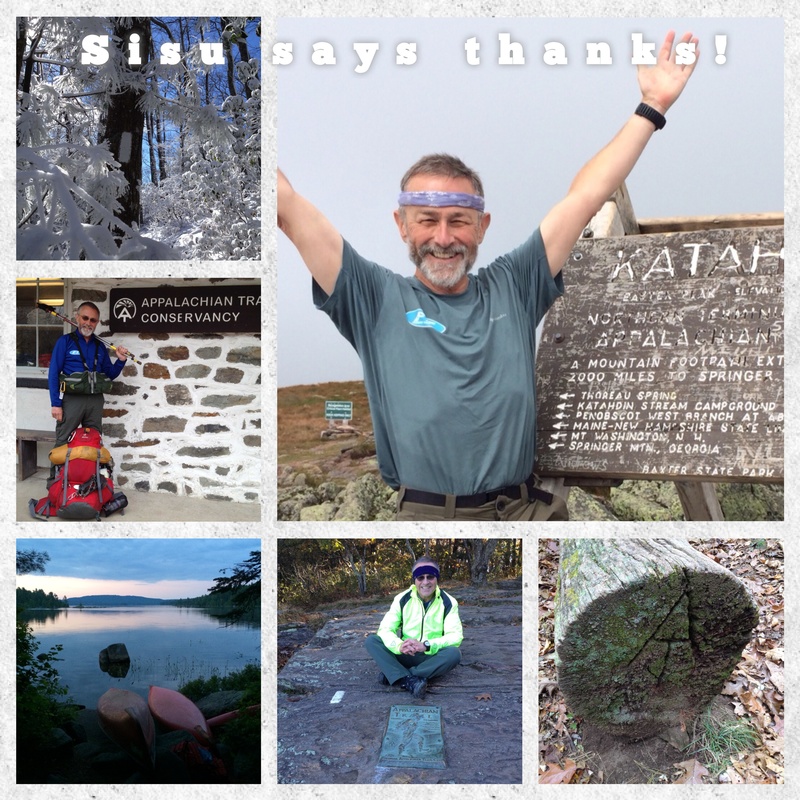 As I have often said, being a successful thru-hiker doesn’t make you special. It only means that you were fortunate enough to have a special experience. Okay, so what happens when it’s over? You go home and then what? Post hike depression is well documented. Of course, I thought it could not happen to me. When your hike is over, if you’re lucky, you have to get back to work. That’s true for most hikers. If you have something lined up – say going to grad school – you’ve got it made. But even if you have to job search, you’ve got a defined focus for your time and a purpose to pursue. If you’re retired, that’s another story. 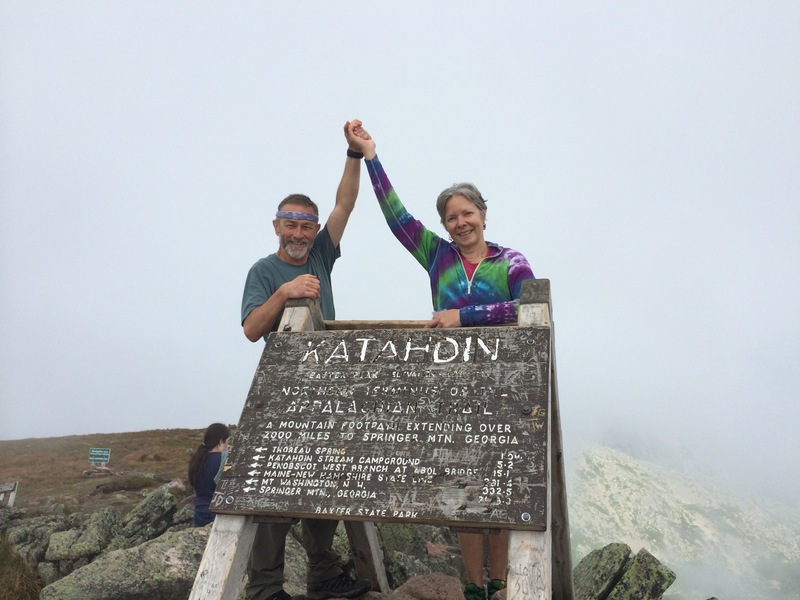 Recently retired people are the second largest, albeit, small category of thru hikers. A lot of them shut the door to their offices and open the front door to the AT with little transition time. I met a hiker in Georgia this year whose time lapse was four days! Boom! The hike ends. You take a victory lap. The the crowds stop clapping. For months on end you’ve had a routine. Wake up, eat and hike. Following the white blazes was my job. Where is the next white blaze? Aside from the daily trail routine, hiking is heavy exercise that bathes your brain in a heavy flow of endorphins all day long. Like distance running, the craving doesn’t stop when you end your journey. Endorphins act like opiates. These chemicals, manufactured by your body, make you feel really good. When they go away, the funk can get very deep indeed. I thought that returning to a strenuous exercise routine and increasing my volunteer activities would help me avoid endorphin withdrawal and the mental depression that goes with it. NOT SO! I did all these things, but in between, I sat in my easy chair and stared out the window or zoned out with ESPN on the idiot box. My reading habit evaporated. In the past year I have completed exactly one book; that compares to my 3 to 4 per month lifetime average. My motivation meter was pegged at zero. There’s more. My weight began to creep up. I did switch back to healthy foods from the ultra high calorie trail junk, but I ate a lot and drank more beer. I’ve regained about 75 percent of my lost weight. After my voluntary stint as a ridgerunner in Georgia this spring, my mind began to get a grip. Maybe returning to the scene of the crime helped. I remembered why I retired in the first place. My retirement routine couldn’t replace my previous career as an adrenalin junkie. The 60-hour plus work weeks needed to be left to history. The new normal needed to be new. Now my volunteer time is structured around specific goals. I’ve found opportunities with much more responsibility – to the point where I supervise five paid employees in one of the gigs. Best of all, I’m beginning to have a lot of fun. For now, one year after my hike, retirement has become a never-ending process. I’m contemplating more hiking adventures, but I’ll tackle them differently. For example, I’d love to hike the Pacific Crest Trail. (“Wild” by Cheryl Strayed is set there.) But if I do, it will be over three years in sections rather than all at once. If I learned one take-away from hiking the Appalachian Tail it is that thru hiking takes a long time. While I loved my hike and would do it again, I got tired of being out there “forever.” Moreover, making “forever” so is not a reasonable expectation. Looking ahead, I’m hoping to better use my time because at this stage of life, you truly have to do more with less. Post card I sent to those who helped along the way. One of the best parts of my final day on the trail was to share it with my friend Karen (Tie) Edwards. Here’s a link to a one of several videos I’ve made in support of speeches I’ve made this past year. This is a most wonderful writing. The sheer joy in your face is clear. I like the idea of structure and goals in your volunteer work. Thanks Jim. I’m learning that retirement is evolutionary rather than revolutionary. My hard head serves me well sometimes and not so much at other times. The journey continues. Did you and Melonie experience similar drifting, or were you able to start your transition long before your actual retirement dates? When I retired from the Army I went straight to Civil Service. At the same time, Patty went to the Air Force Academy. We are finally making the transition you mention … Age (57 for me) is the factor. Glad to hear you are feeling more directed and less restless. Those are important stages. I will check the link later when not on my phone . That was a good read! If you do the PCT perhaps you should keep a journal? You are an excellent writer. What’s funny about reading this I was just talking to someone this morning about you. Great to hear from you Larry! Good stuff again, thank you for reflecting. My short lived obsess…I mean fascination with thru hiking started when I watched nice picture compilations like yours in the download link. It was fall 2013 and the government shutdown ruined our plans to visit the Shenandoah National Park for the first time. Had time in my hands and watched some Youtube videos from Shenandoah. Ended up seeing a lot of footage from thru hikers. It looked like so much fun in those few minute compilations. I hate driving -walking the trail seemed to be the perfect way to travel the Appalachian mountains. Of course after researching and studying thru hiker journals the reality set in. By the way, thank you for recommending Karma’s journal in your blog. It was excellent and I got the sense how it feels to be out there. From all the journals I read I gleaned that half the time it’s green tunnel, rain, obsession with food and summiting mountains in dense fog. And a lot of people get sick and hurt or just sick and tired of being on the trail. Now I also realize that a lot of thru hikers drive as much distance as they hike or have somebody else drive. So I wanna do like Bill Bryson in “Walk in the Woods” and drive the Appalachian trail, ha ha. Or more correctly have my non-hiking husband drive and provide me rides for some day hikes. We are in good start, fall 2014 visited the White Mountains and Shenandoah for the first time. Hitting the highlights is a valid way to home the trail. A couple named Trooper and Number Two wrote a funny Trail Journal in 2013 as they did just that SOBO. I recommend it. I am sorry we never met on the AT. I left late (April 26) and finished late (Sept 24) but the trail experience was incredible. I am not retire although I am in my 60s. The hike ended and I returned to my job. But I hope and pray that the trail will never go away. It is a daily part of my mindset and motivation. I loved the adventure and want to continue the AT enthusiasm for life. Thanks for sharing your anniversary story – it is always appropriate to celebrate memories. An excellent article. When I finished my through-hike in 2006, I was “lucky” in that my job was still open after my leave of absence and I was actually forced to return to it three days after summiting Katahdin or they would give it to someone else. That kept away the blues, I suppose. For years after my hike, I would say that I was glad to have done it, but never wanted to do it again. For me, the hike itself was one of those transformative experiences that you often read about in trail memoirs. What those memoirs often fail to make clear, however, is that a true transformative experience is often achieved only through pain and misery so great that once you escape it the everyday concerns of your daily life are rendered trivial in comparison. The people who expect an effortless spiritual experience are the people who quit at Walasi-Yi, that first major road crossing, a mere thirty miles into the journey. 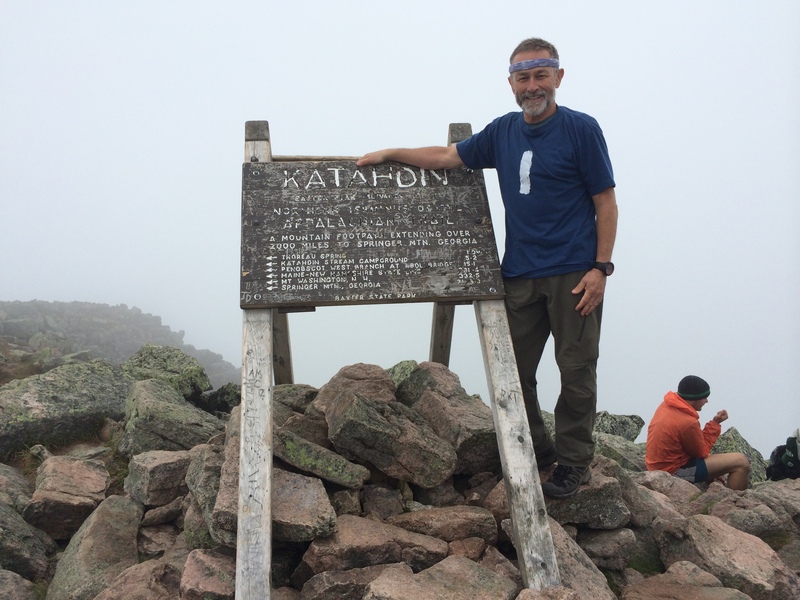 The funny thing, though, is that even knowing that the hike is mostly a wet and miserable slog that you just wish could be over…at this moment, nearly ten years after I completed it, there is little I would not give to have the chance to do it again. As it is with all things, the bad memories fade while the good memories remain. Once retirement comes around, I think I may just find myself standing atop Springer Mt. and taking my first steps on another 2k+ mile journey. Spot on. At 66, I won’t thru again, but I can fully appreciate where you are. Were I in the same situation, I’d follow your lead.